Comm Eye Health Vol. 23 No. 74 2010 pp 58 - 59. Published online 01 December 2010. Trachoma is the leading infectious cause of blindness worldwide. Corneal scarring, which causes trachoma related blindness, occurs when the upper eyelashes are turned inward and rub on the eye (cornea). This is called trichiasis, and if the lid margin turns inward, the term entropion is used. Currently, there are an estimated 8.2 million people with trichiasis and 3.1 million people are blind from trachoma. A systematic review of population based trachoma surveys has shown that women are affected by trichiasis approximately twice as often as men. Trichiasis is more common with increasing age; however, in communities with very high levels of trachoma infection, trichiasis can occasionally occur in children. Persons who develop trachomatous trichiasis (TT) usually need treatment to either surgically turn the eyelashes outward from the eye or to remove one or two in-turning eyelashes which are not central or touching the cornea; the latter is pulling out the in-turned lash or lashes with forceps, a procedure called epilation. Bilamellar tarsal rotation (BLTR) or posterior lamellar tarsal rotation (PLTR) are procedures widely used in trachoma endemic countries to surgically treat TT and are believed to produce comparable results. Patients may be unaware that surgery can help, or they may be afraid of an eye operation; as a result, uptake of TT surgery is often low, even when surgery is provided free of charge. Sometimes, the fear is reinforced by awareness in the community that, at a particular clinic, trichiasis often comes back after surgery, which has a negative impact on uptake. Some patients find the cost of travel to seek eye services, or the lack of a companion to go with them, to be a significant obstacle. This is particularly true for women who also have to look after children and the household and cannot afford the time to go for treatment. Sometimes, it is just too great a distance to a health facility, so people will not go for treatment. In some situations, services are simply not available, nobody has been trained to perform trichiasis surgery, or the necessary equipment and consumables are not available. Strategies to address the TT backlog will vary from country to country and setting to setting. These may include: creating awareness of treatment for trichiasis through health education, including radio programmes; ensuring TT surgery is available at low cost and close to where people with TT live; or conducting enhanced outreach in communities where trachoma is common. TT surgery can be performed by well trained ophthalmic nurses, assistants, or doctors. There is good evidence that TT surgery can be done by non-ophthalmologists with comparable results to those of ophthalmologists. One of the challenges is to encourage the trained TT surgeon to continue to work in rural areas and to equip them so that they are able to perform sufficient TT operations per year to maintain good experience and quality. Unfortunately, the quality of training of TT surgeons can be variable and adequate supervision may be lacking, leading to high rates of recurrence of TT after surgery. Surgeons who only do a small number of TT operations each month tend also to have poor surgical outcomes, leading to a vicious cycle of low uptake, low productivity, and poor surgical quality and outcome. Breaking this cycle requires good planning and a willingness to acknowledge that results can be improved. In order to develop a TT service it is useful to address various levels of eye care delivery. At a national level, it is necessary to identify areas with a high prevalence of TT and to prioritise these areas for TT surgery programmes. TT surgeons need to be given good quality training and be adequately equipped. Quality of care is essential. In order to improve the quality of surgery, training of TT surgeons should be standardised and surgeons should be certified using the World Health Organization manual on assessment of trichiasis surgeons. Due emphasis should be given to the selection of trainees, the creation of a career pathway, and supervision of TT surgeons. TT surgeons must also have adequate supplies of instruments and consumables. Services, whether static or outreach, that are staffed with poorly skilled, inadequately supervised TT surgeons can result in poor surgical outcomes and negative publicity for the programme. At the health centre level, transport to provide outreach programmes for TT surgery in affected communities is required, together with good provision of consumables to perform the operation: medicines, sutures, dressings, and so on. It may be necessary, in some situations, to consider offering incentives (such as a financial reward) to encourage good TT surgeons to work in high-volume TT programmes in remote areas. At the community level, women must be specifically and deliberately targeted for trichiasis surgery. A successful trachoma programme requires the involvement of affected communities through their village leaders, women’s group leaders, teachers, community health agents, health extension workers, or similar frontline health personnel. Recruiting village women who have had successful TT surgery to raise awareness and encourage others with TT to have the operation has proven to be a successful strategy. An outreach programme includes awareness creation in the community about trachoma, seeks community involvement in planning and executing the activities, and tries ultimately to engage the community to such an extent that they become the true owners of the programme. Community involvement and engagement is therefore essential for community ownership and the successful implementation of the full SAFE strategy. Community and local health service planners need to decide what contribution community members can make towards the cost of surgery. This will help to achieve sustainable service delivery and avoid a situation where the community either undervalues the service (perhaps because they consider a free service to be inferior) or where a state of dependence is created. Having said that, the cost of surgery should not be so high that poor patients cannot afford it. In summary, it is essential to consider patients’ needs. This will require comprehensive planning at national, district, and community levels to adapt and strengthen the health system to meet these needs. The ultimate aim is for patients with TT to have successful surgery, be satisfied with the result, and be advocates in their communities. Only then will we achieve the ultimate goal of the elimination of blinding trachoma. S Resnikoff, D Pascolini, D Etya’ale et al. Global data on visual impairment in the year 2002. Bull World Health Organ 2004;82: 844-51. EA Cromwell, P Courtright, JD King et al. The excess burden of trachomatous trichiasis in women: a systematic review and meta-analysis. Trans R Soc Trop Med Hyg 2009;103(10): 985-92. Y Adamu, W Alemayehu. A randomized clinical trial of the success rates of bilamellar tarsal rotation and tarsotomy for upper eyelid trachomatous trichiasis. Ethiopian Medical Journal 2002;40: 107-14. D Habte, T Gebre, M Zerihun. 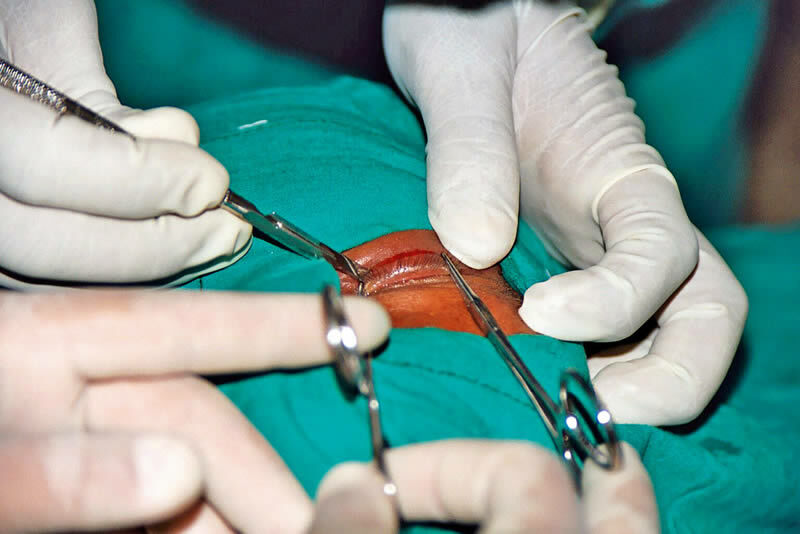 Determinants of uptake of surgical treatments for trachomatous trichiasis in North Ethiopia. Ophthal Epidemiol 2008;15(5): 328-33.
RJ Bowmann, H Faal, B Jatta et al. Longitudinal study of trachomatous trichiasis in The Gambia: barriers to acceptance of surgery. Invest Ophthalmol Vis Sci 2002;43(4): 936-40. M Melese, W Alemayehu, E Friedlander, P Courtright. Indirect costs associated with accessing eye care services as a barrier to service in Ethiopia. Trop Med Int Health 2004;9(3): 426-31. W Alemayehu, M Melese, A Bejiga et al. Surgery for trichiasis by ophthalmologists versus integrated eye care workers: a randomized trial. Ophthalmology 2004;111: 578-84. SK West, A Bedri, TKT Ton, ES West, SP Mariotti. Final assessment of trichiasis surgeons. WHO: Geneva, 2005.